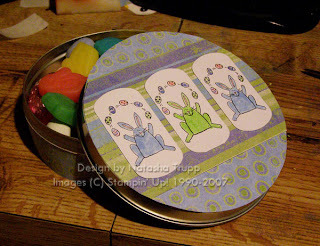 Here's a fun little tin of Easter treats. I used the juggling rabbit from Tags So Much (a hostess set). I didn't think the tag punch seemed appropriate on the round lid for the layout I wanted, so I went with the key tag punch, which worked well! In case there's any questions as to the tin, it once held Epicure Selections chocolate covered coffee beans (so good, I don't like coffee, but coffee beans, I do, go figure). I also was using up some more of the Costco #3 paper pack. I liked these spring colours and used them as inspiration for the coloured rabbits. 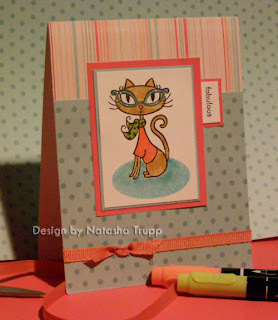 One of my other favorite stamp companies is Pink Cat Studios. The stamps are very fun and cute! I really like the cat sets. This one, the retro kitty, is especially fun to colour. I chose the classic 50s colours, even gave the cat a sparkly pair of glasses. 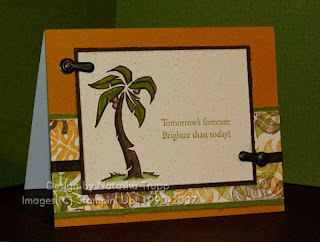 This card all started however when I was browsing Jeanne's blog (found here ). She inspired me to try and make my own oval shadow stamps. I too, have the bag of rubber scraps. It's really old stuff too, I don't keep the new ones, unless there's a big size. Anyway, so since it's aged rubber, haha (sounds like fine wine or something), the rubber part peels away from the sticky foam stuff really nicely. It didn't even have any grody sticky residue. Now, this rubber is thin enough to fit into SU! larger stamps. I could easily cut through the rubber with my large and small oval punches! Woot! I had some EZMount lying around, so look at that, 2 fantastical shadow stamps that cost virtually nothing. I love it! The paper on the card is from one of Costco's paper packs (#3, I believe). 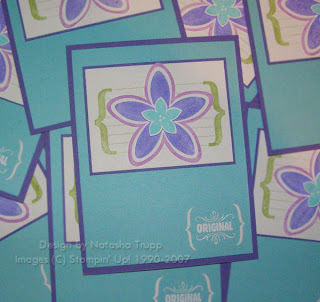 I thought it would be fun to feature a stamper, my sister, Tamara. She has a gallery at SCS under the hilarious username PoodleNugget, but many of her creations tend to get missed. 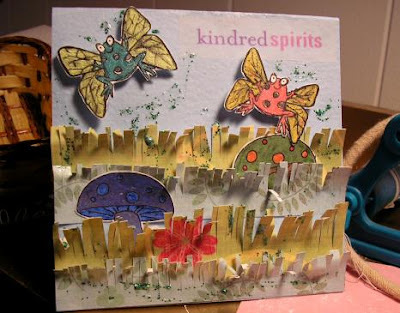 I love her sense of humour and how when she sets out to make a card it's all about the fun of it. 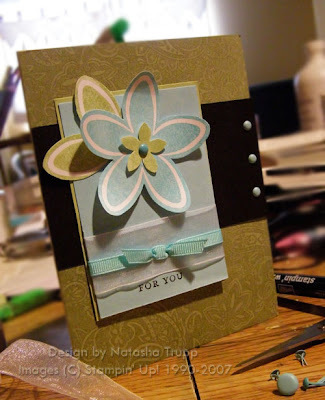 She's crazy about details, like me, and she refuses to make "boring" cards. She stays away from making stuff like everybody else, instead doing what makes her happy, which is awesome! I know I tend to get into a slump of pleasing others instead of myself. Here are 2 of her very cool creations that she made for this last VSN. 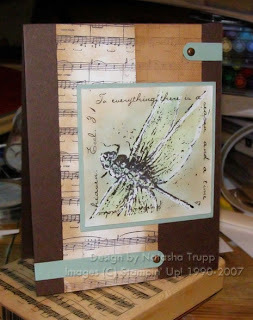 For the magic-themed challenge she drew these fabulous wings and made this very fun and dimensional scenic card. I just love this one, it's totally different and fabulous. This other one started out as a joke. When I visited Tamara in November I brought some of the Colorbok chipboard slab. I was really into chipboard, and she hadn't used much yet. This slab, although very cost-effective has some strange shapes that I knew I would never use, like this chipboard apple. I'm not sure how it started, but she decided to draw a little worm, then it became a vampire worm, and so on. 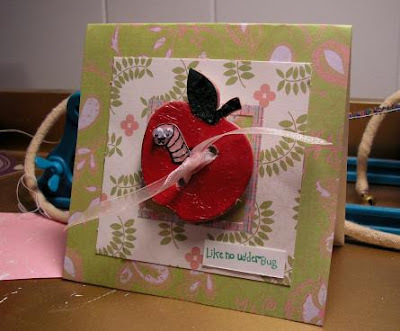 So she had this "embellishment" just waiting to be placed on a card. Well, the challenge I hosted for this last VSN was faux buttons, so she made it into a button. It is the creepiest, most hilarious faux button I've ever seen. Plus, I like how she combined 2 of the very punny sentiments to create a humorous greeting. Here's a card I made for the fairly new Sunday challenge at SCS. 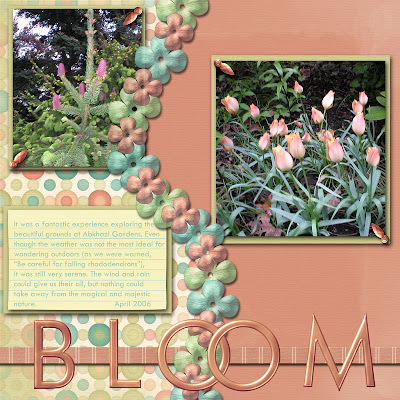 There's a featured stamper and the challenge is to go through their gallery, pick one that inspires you, and recreate it, but change a few things. Here's my challenge card. I kept the same layout, a few of the colours, and the basic overal theme of the card. 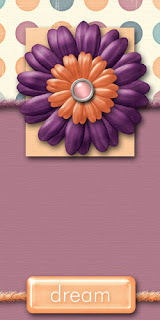 I changed the images and the types of embellishments. I was also playing around with my camera. I decided to do a bit of prettying up in the scene. I also went with a crooked shot, I thought it would be an interesting change. 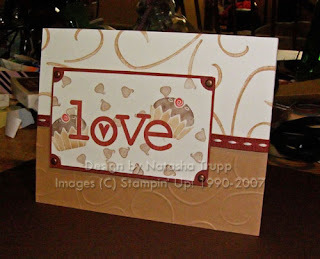 I needed to make a card today, but I just wasn't feel inspired to use any of my stamping stuff. I recently discovered AtomicCupcake.com which has loads and loads of digital stuff. So I pieced together a card using a variety of the items available there. I chose the size 3.5x7, started from there in Photoshop, then went to work. 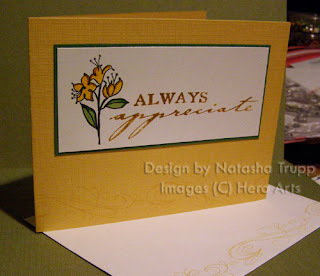 Then I printed it out onto cardstock, voila, instant card! Don't worry, I haven't abandoned my stamping, I just needed a mini-break. Tomorrow I will probably attempt something else. Today is kind of a don't feel like doing much of anything day. I'm posting the computer, flat version of the card, instead of a photo of a digital creation (that seemed redundant). And here's another digi-page. Again, I used various items from Atomic Cupcake. This one has photos from my Spring trip to Victoria. This was one of the tourist-y places we checked out. It wasn't all that tourist-y when we were there, as it was extremely windy, rainy, and chilly. However, all the flowers and plants were still very beautiful. Also, since it was so cloudy, photography conditions were actually quite optimum. I've got some way better photos from that day, however these ones matched colour-wise with my page. Here's my Wednesday Sketch Challenge creation. You know, considering how versatile this layout is, it certainly isn't one I use very often, but it works. And I think it would work for a lot of items. I always like to bring out this stamp set. It makes me happy in all its tropical goodness. At first I was going to go for more cheery tropical colours, but I thought that these earthy tones were better suited today. I splattered brown watercolour all over the vanilla, and did a whole lot distressing on pretty much any edge possible. I used an xacto knife for the distressing, it works like a charm, and is more comfortable to grasp than some of the other distressing tools I have tried. I bought this fun Basic Grey paper from the Blush line (this one is called Tease) and thought that it'd be fun to try and get some of my chipboard to match the floral and dotted designs on it. 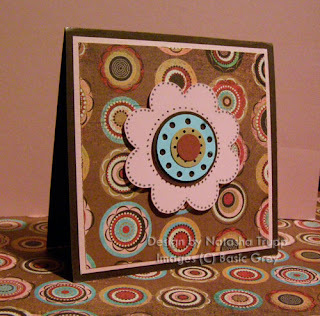 I painted a floral piece of chipboard the light pink, then used various circle punches to make a layered flower center in the colours of the paper (I used caribbean, caramel, chocolate, and cranberry). I also added little dots all around the flower using the chocolate marker. I made a Sammi page the other day, so it is only fair if I make a Gizmo page! I had lots of fun with this one. One thing I love about digital scrapping is the flexibility. If you don't like it, delete it; not big enough, change the size; wish you hadn't put that picture there, move it! 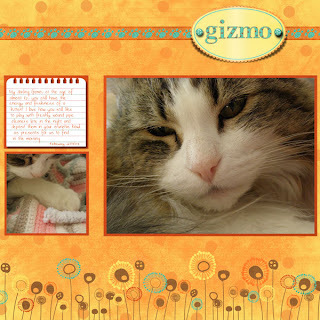 Again, here's my cheesy journaling for those who care: My darling gizmo, at the age of almost 16 you still have the energy and friskiness of a kitten! I love how you still like to play with freshly wound pipe cleaners late in the night and deposit them in your crunchie bowl as presents for us to find in the morning. - February 2007 The page is made of of items from an ASPCA charity set. 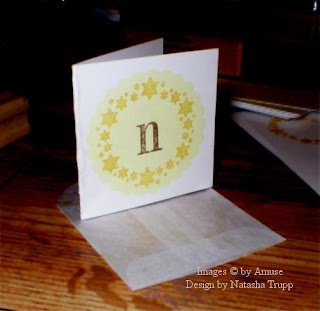 The little ripped out notepaper is a freebie from Shabby Princess. I know it's past valentine's day, but I had bought these awesome coloured rub-ons, and then today I was also playing around with the specialty edged scissors (remember when those were practically the only "cool" tool for papercrafters?) and this is what I came up with. I am always a fan of pinks and browns. So much so that I am almost running out of my Regal Rose equivalent from Jody's ribbon swap. However, I was checking out Canadian sources for grosgrain, and this place seems to look pretty good: Dunwoody Booth . I haven't ordered from them yet, but they offer 100 yard rolls of 1/4-inch ribbon for $14.50 and there are 81 colours to choose from!! And that's just the plain grosgrain, they have plenty of patterns too. 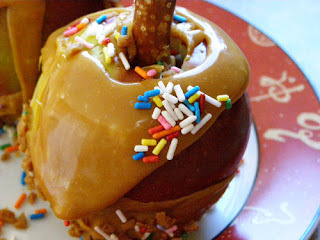 Earlier this week I had a serious hankering for a caramel apple. They always look so amazing, but I am too cheap to buy one. Instead I went with a Spartan and some of those square caramels. I just heated the caramels at half power in the microwave for a minute at a time until it was nice and runny, then I dipped my cored apple into the caramel, and rolled that into a pile of Skor bits and sprinkles on wax paper. I used a long pretzel for the stick, this was quite a nice contrast with the sweetness of the candy, and the tartness of the apple. Amazingly, I didn't even make much of a mess (a rarity when I am in the kitchen...). I just really liked this photo I took of the apple and wanted to share it. I really liked this layout from my card frenzy on Monday. I also needed a birthday card that needed to match a lovely Cool Caribbean set of tea towels. I didn't feel like coming up with something different, so I went with a past colour challenge (#72 , I believe, although I used Regal Rose in place of Pretty in Pink) and copied myself. You know, if you've made something that works, why not try it again, but with different colours! 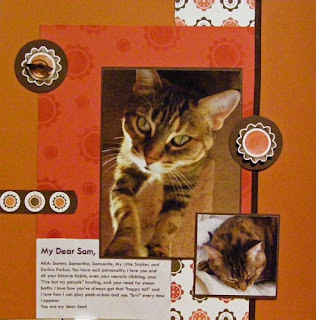 I decided to take a stab at some more scrapbooking. I used one of my cat's as the theme here, since I had this one particularly cute picture of her that I wanted to showcase. You know what, it is not very easy to photograph 12x12 items when you are used to photographing 4.25x5.5 items! The light I have in my space, which works really well for photographing the cards, hits the page completely differently. Also, all the stuff on the page is adhered straight, but that's another problem with photographing these sorts of items. I just need a little practise. Anyway, I hope you don't mind the change of pace. I know I haven't updated in 2 days (gasp! ), but alas, I didn't really have any time at home, but as is usual, with the weekend almost here, I shall have more time! Woot! If you happen to care, here is my cheesy journaling (I'm new to that aspect). 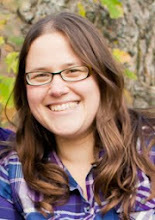 My Dear Sam, AKA: Sammi, Samantha, Samsonite, My Little Stalker, and Dorkus Porkus. You have such personality. I love you and all your bizarre habits, even your neurotic nibbling, your "I've lost my people" howling, and your need for steam baths. I love how you've always got that "happy tail" and I love how I can play peek-a-boo and you "brrt" every time I appear. You are my dear Sam! By the way, if you are not already, you should be saying "my dear Sam", like Frodo does in Lord of the Rings, it's just funnier that way. Here is a quartet of cards I made today (be sure to click the photo to get a better view). 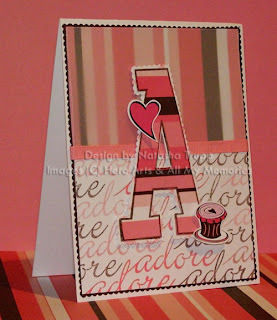 There was a challenge to use one main image set, a background set, a word set, and one colour scheme and make 4 cards. I added just one other set for one of the cards, but hey, they're mine, so I figured I was allowed :D. They all measure 4.25 square. I don't really have much to say about them, I'm really happy with how 3/4 of them turned out and I love that they all match. The top two cards I had already planned out before hand. The one in the top left was something that I had wanted to try based on another card I had seen. The one on the left is based on a sketch I jotted down yesterday. I changed it a bit, since the small size just couldn't fit all the details of the sketch. The bottom left one has some "home-made" striped paper. I took a bunch of my scraps and pieced them to make my own designer paper, but it's hard to see that in the photo. The bottom right one, I took a stab at making my own designer paper again. 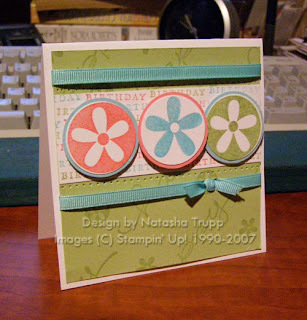 I stamped the "birthday" stamp in several rows in the 3 colours. It looks really cool and wasn't that hard, or time consuming (I didn't worry too much about straightness since I was covering most of it). I think I will definitely do that again with some of the other words in the Happy Everything set. Here's my 2nd set for one of the swaps I'm in. I had lots of fun making these, even though it took forever since Sammi (the cat) had to help too. I hope none of my recipients are allergic (just kidding, the table was the ONE place she didn't visit). I used several punches creatively here. Once again, used the corner rounder to make a scalloped circle. I would not recommend doing this for excessive amounts of cards though, after 8, my index finger was getting sore from the punching. I also used the 1-1/4 circle punch to make the key tag punch frame. I got this idea originally from Jan Tink, however I did modify it a bit to speed up the process. I cut the piece to slide through the punch to 1-1/8 (instead of 1-3/16, I just avoid using 16th if I can). Also, instead of cutting the one side, attaching my sentiment, then doing the other side, I just cut the slider piece to 2-1/2 inches. This gives enough room to do the punching. I just found this was better for assembly lining. You get a little bit of variance in the length of them, but it's pretty minimal. I love the 2 flowers in this set! They are so pretty. Anyway, here's my first completed swap, of three. I went with a current favorite colour combo, except instead of using lavendar lace (since I have almost none), I used lovely lilac. They really are so similar. I stamped linen on the caribbean piece. The "original" is embossed in white, and the parentheses are from the rounded tab punch. I mod-podged them on, since that was the easiest way at the time. The littlest flower is popped up on a dimensional. Both flowers were painstakingly cut out, then centered over the "memo" journaling block. I hope my fellow swappers enjoy it! So, I got my new Spring Mini stuff today! Woot! At the last meeting, me and Fran discovered that the parenthesis you could make from the new punch could be used as a mustache. 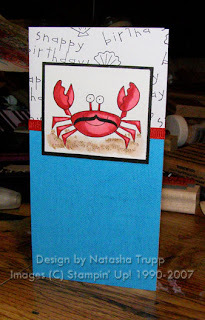 And what better place for that mustache than a crab?? He seems a little French now, Oui? This was one of those cards that I just wanted to finish, so I didn't make it overly complex. Of course, since I wanted to keep adding to it, it ended up taking a ridiculously long time. I'm Mary Catherine Gallagher.... Does that pop in your head when you see this card? Come one, who has the picture of her in your mind right now?? I had meant to do this design quite a while ago, but then VSN happened, and then I had post-VSN-lackofcreativity syndrome. However, it's nearly the weekend, and with a gentle nudge from my sister to not let any stamps go ignored, here's my latest creation. 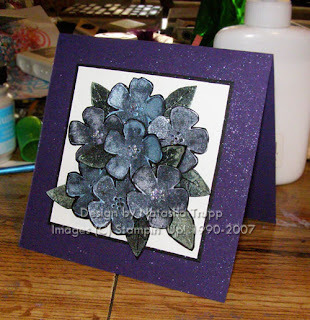 I used lots of my gold embossing powder here. I also used silver cord, because, GASP, I don't have any gold. It still worked with the design though. I received my birthday present today from my brother and his girlfriend. So, of course, I had to break it in, and what better day than Sketch Challenge Wednesday to do so! I had specifically asked for a sheet music background stamp, and that is what I got (and a cool Canada's Wonderland monster finger puppet). I wasn't in the mood for pairing it with flowers, so I decided, whynot the dragonfly? I just kind of decided on colours based on what was near me. Although putting almost any softer colour with shades of brown is usually a reliable colour combination. I did a little bit of crayon resist with the dragonfly image.The extended word window tabs were made by folding the paper in half then punching through the two layers. Here's another submission I did for VSN. This one was based of an inspiration piece, a set of dishes. 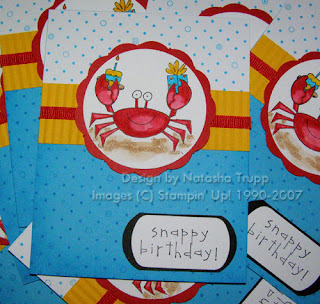 I used the colours, patterns, and subject matter and made a card. 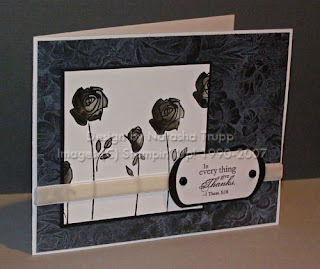 The bottom half is dry embossed with the swirls from the Bodacious Bouquet brass template. The ticket corners were made with my 1/2 inch circle punch. I've marked it at the halfway point so I can easily line up my paper everytime! 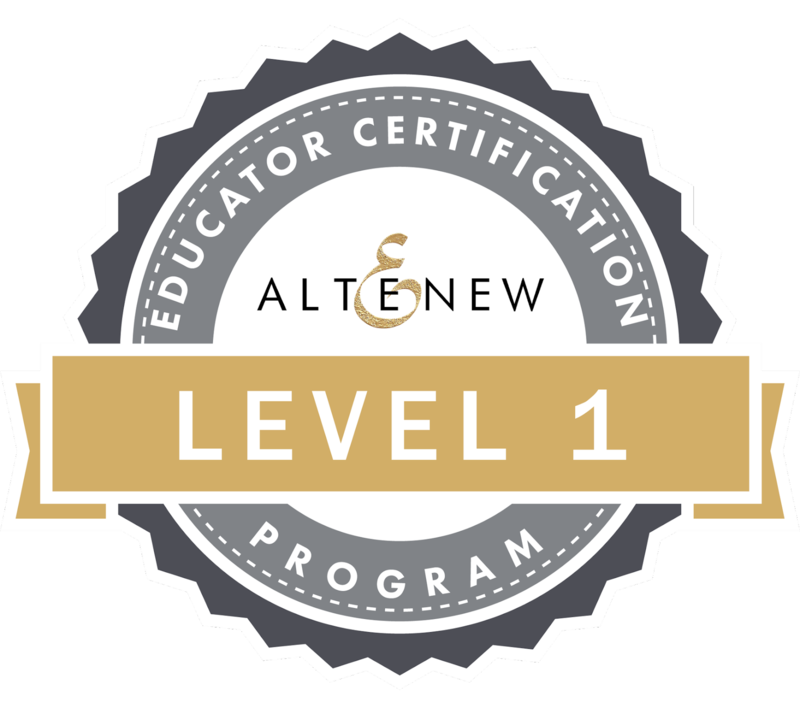 Well, we did it! I'd say VSN was a success, I've just got to wait until 4PMest, before I can start to judge those in my category. My challenge was chipboard buttons. 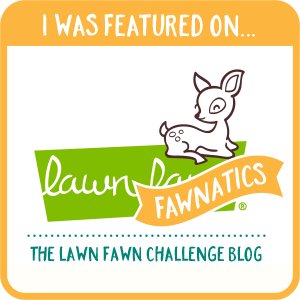 I wanted to have a challenge that hadn't been done before, that used something trendy, and that hopefully showed people are to make the most of their resources. Why buy an embellishment, if you can make one, right! Anyway, I ended up doing 11/14 (there were 15, but I couldn't participate in my own!). Here's a few of my favorites that I made. One of the challenges was to use candy as your inspiration. 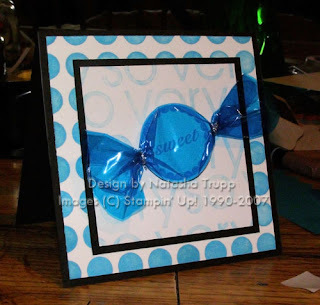 I stamped the 'sweet' image, then wrapped it in blue cellophane. I really like how this turned out. I think I will definitely make "card candy" like this again. I made this one this morning. It's a bit crazy with the shimmer and sparkle, but it was lots of fun to make. I mixed Lumiere and Pearl Ex, and stamped my images with those. Then I cut them all out, added some glitter and made a pretty bouquet. This was was for the Pearls & Diamonds challenge, so that's why I used so many sparkly mediums. Here's another one of my entries for VSN. The challenge was to make a quarter fold card, which is something I'd never done before. Originally I was going to do an underwater themed card, so I got out these colours, but then I used what was near me instead. 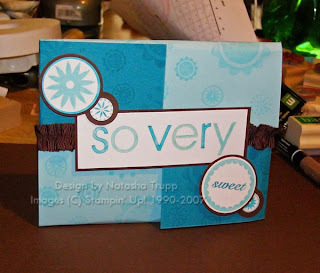 It started out quite simple, with just the background stamping, and the so very and the sweet pieces. But it wasn't enough. So out came the fancy ribbon, then it wasn't balanced, so I added some more big and little pieces and mounted them on pop dots. The so very is attached to the chocolate ribbon, and this works as a belly band for the card. When it's off the card, it totally looks like a garter, so funny. 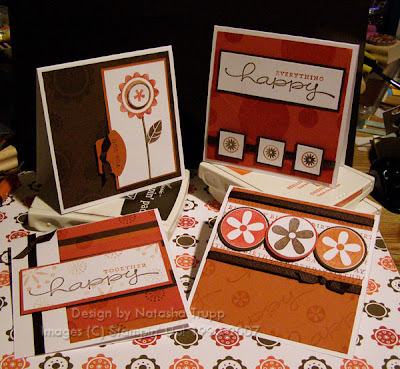 Tonight is the first of 2 nights of VSN (virtual stamping night) at SCS. Here's my first of hopefully many projects. I may not post them all here, but they will be over at my gallery there. If you've got some spare time, I highly encourage you to participate. It's lots of fun!! The first challenge was to either make a chocolate bar wrapper or a cocoa holder. I made a cocoa holder using a bunch of my holiday Basic Grey papers. I used the Fruitcake collection, as well as some Dasher papers, and some undressed Chipboard, which I, of course, dressed up!! I made this card because there was a challenge last week for black and white cards. There was a contest involved, however, I did mine a little too late to enter. I still wanted to participate, so here it is. 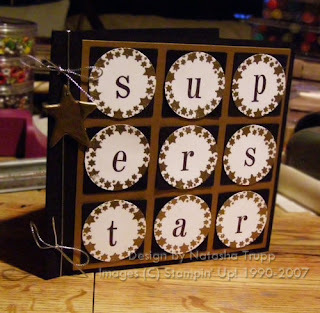 I made the key tag frame using Jan's awesome tutorial, found here. The background black paper is actually shimmered black cardstock I bought a while ago. I didn't feel like doing the once stamp off using Floral to get the more faded white background, so instead I used white Stazon (which tends to not appear quite as solid on porous, dark items). I also used more of my fabulous velvet ribbon. I love that stuff, it's so pretty! !